The big day is almost here! Everything’s set & ready, and our kids cannot wait. The youngest son, who is still a firm believer in the jolly big guy in his infamous red suit, is already coming up with his Christmas Eve game plan. He’s already figured out exactly what he’s leaving out for the Dasher, Dancer, Rudolph, etc, to snack on that night. Oats, carrots, and apples of course. I mean what reindeer wouldn’t like those?! He’s now moved on to his cookie list. See Santa loves cookies, we all know this. The youngest son, well he shares this love of all things sweet & sugary. He’s on a personal mission to make sure he leaves enough treats out that Santa is fueled & ready to go for the rest of his evening. No, it doesn’t matter that in theory he’s gonna be stocking up and eating up at every stop along the way, before and after. He’s on a mission. A Christmas mission, with cookies for Santa. Which means lots and lots of baking for this Mama. I mean this kid thinks we’re making 5 or 6 different kinds of cookies. I’m all about, and appreciate variety, but geez. Luckily, I have my own little helper and personal elf to get the job done. First up on our Santa To Bake List? 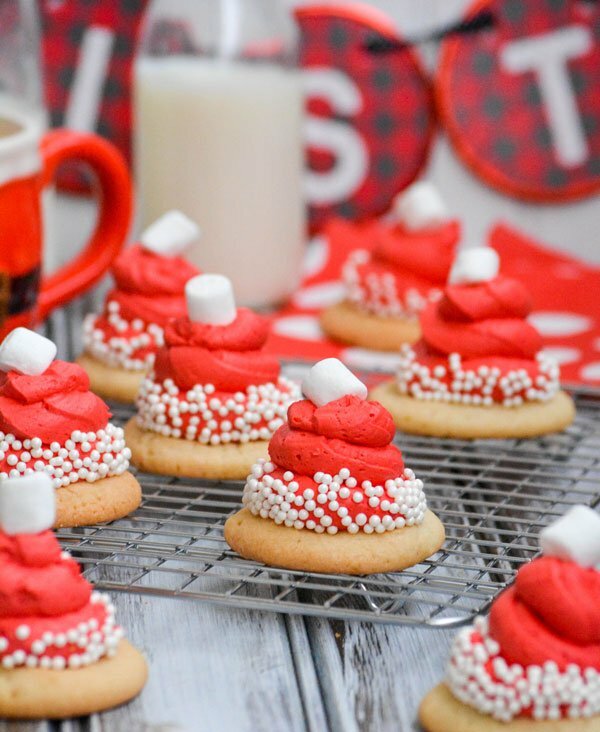 These fun Santa Hat Cookies. 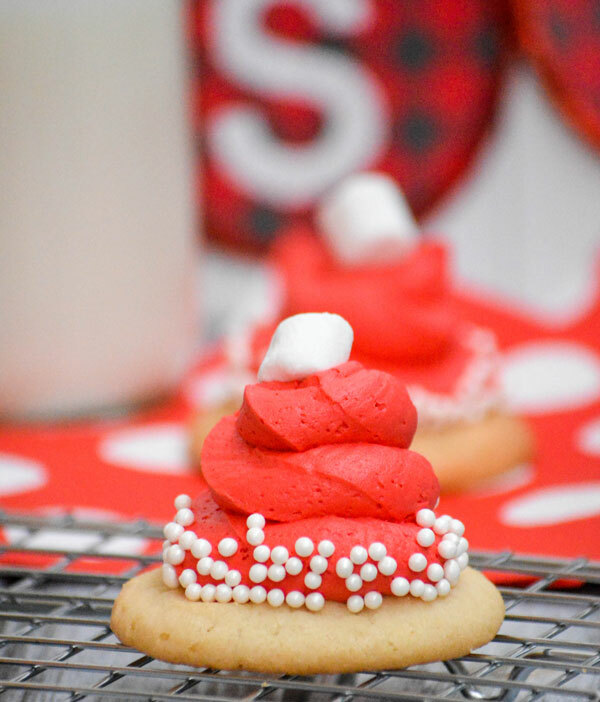 Soft sugar cookies are topped with a rich, creamy red marshmallow fluff butter cream. 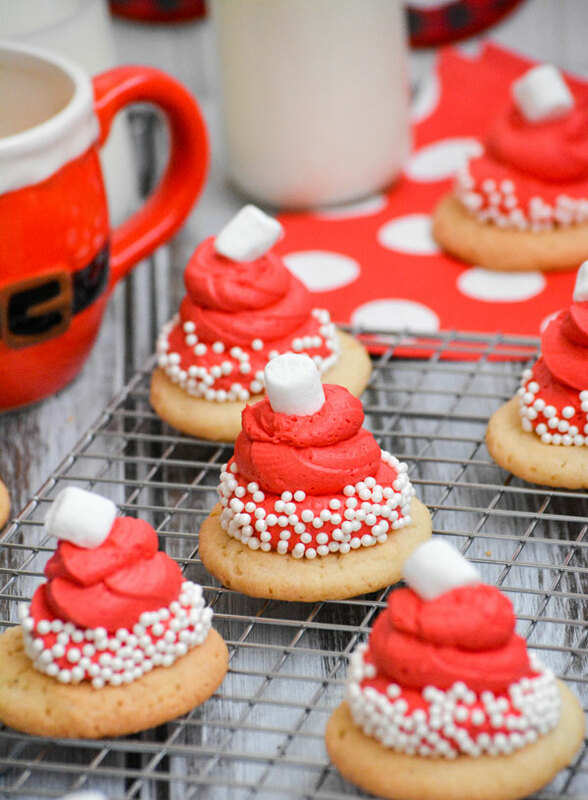 A couple of key accents, and these fun bites are transformed into edible Santa Hats. White sprinkles make his fluffy base, and a miniature marshmallow on top for the puff- we’re in adorable baking business. The son’s were all tickled with the initial results, and figured Santa would get a kick out of them too! 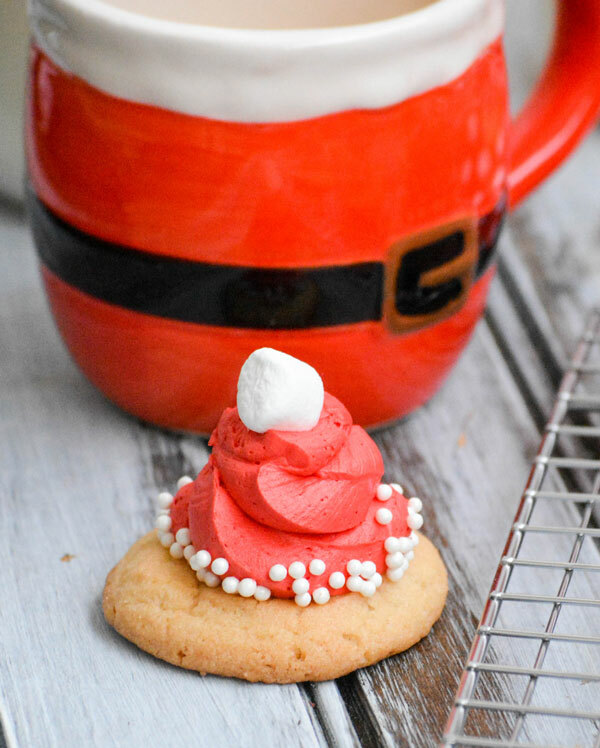 While these Santa Hat Cookies may be first on our list for Christmas cookies, they’re definitely not the last on our Christmas-themed recipe list for the week. Be sure to check back to see the other yummy holiday-themed things we have in store for you, including a tasty cocktail, a must-have Christmas side dish, a round-up of easy Elf On The Shelf ideas (in case you’re running outta ideas like I am at this point), and even a breakfast casserole that will complete your Christmas morning brunch. Promise, they’re well worth the wait, and the follow up! 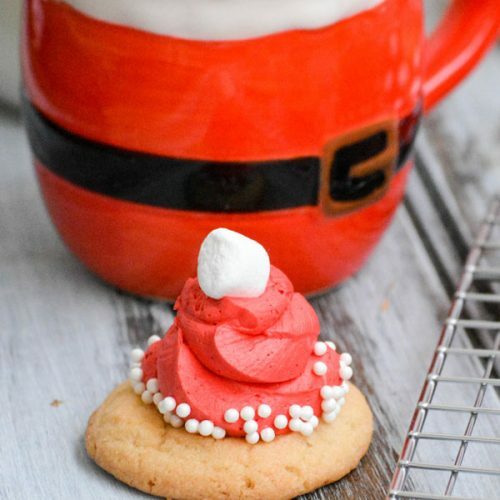 An adorable Christmas cookie, these are easy enough for little hands and pretty enough to serve at any party. Open the package and cut each cookie in half. Using your hands, roll each half into a ball. Put the palls on an ungreased cookie sheet, 1" apart from each other. Bake the sugar cookies at 350 degrees, for 10-12 minutes, or until set and golden brown. Let the cookies rest 1-2 minutes, and then remove them to a wire rack to finish cooling completely. To the bowl of a stand mixer, add the marshmallow creme & butter. Using the paddle attachment, beat them together until smooth and creamy. Slowly, a little bit at a time, beat in the powdered sugar until it's completely incorporated and the frosting's fluffy. Add the food coloring, mixing again until it's mixed throughout and the frosting's a uniform red. Spread the edges of a gallon sized ziplock bag out over the lips of a small-medium mixing bowl (whichever it fits over). Add the frosting to the center of the bag. Pull the edges up, twist closed over the frosting, and use scissors to cut a small whole in one of the bottom corners. Pipe the frosting into a wide circle, and then pipe in and up into a hat shape. 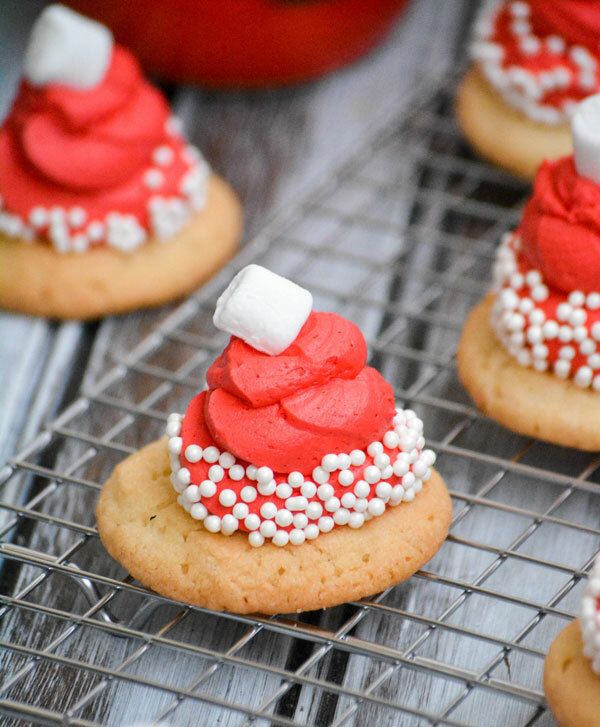 Top each with a mini marshmallow. 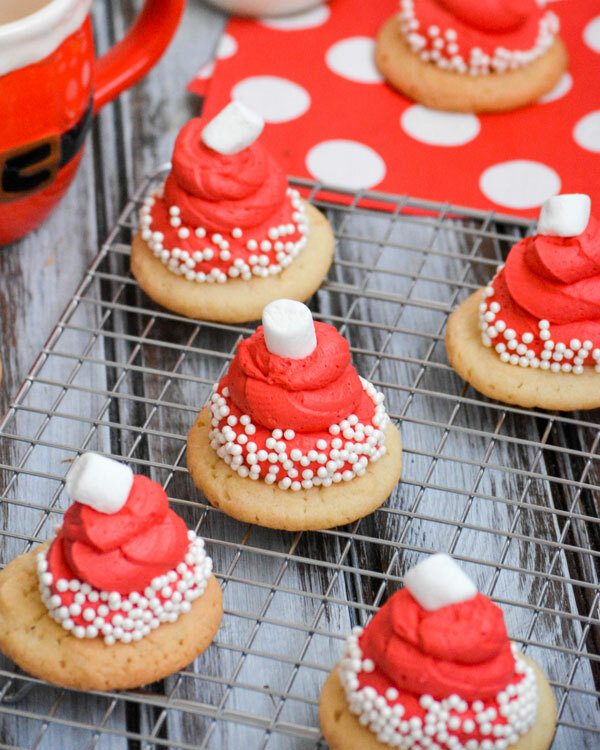 Immediately (so the frosting isn't dry & it sticks) sprinkle the sprinkles around the bottom of the frosted cookies to resemble a Santa hat.